Well, it is good to be back in the swing of things after Thanksgiving. Our trip was nice, and I enjoyed getting to spend time with Drew's family, but unfortunately, I was sick nearly the entire time we were there. I still feel kind of icky, but way better. I have the Care Now doctor stumped, but don't plan on going back to waste my money on him trying to figure it out with limited resources. If I start feeling worse, I will ask around and try to find a "real" doctor - not saying that Care Now docs aren't real, just probably need to go to a specialist, or someone with greater resources. 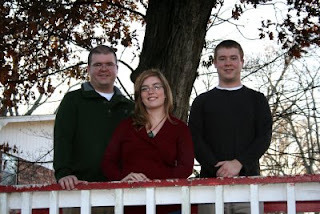 Anyway, here is the photo of the "Dodd kids" we took on Thanksgiving. I think I could have looked quite a bit better if I weren't grimicing in pain (smile through the pain!!). Oh well... my hair is messy and the sweater (which I am wearing again today) makes me look fat, but at least Drew and Steven look awesome. My darling husband was helping his dad outside while we were there, and they heard a weird noise - like someone screaming. Guess what it was? A kitty - a mean, horrid little spoiled rotten kitty who now lives in our house and terrorizes my sweet little Clark and tries to eat our human food, and runs around non stop running up your leg, meowing, and picking fights. *sigh* It's a good thing I love animals so much, or else this cat would be finding a new home outside in the cold. 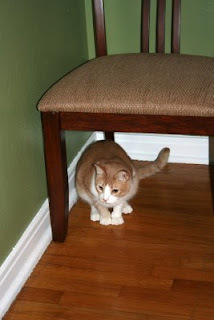 The picture below is of Clark hiding from Lois (yes, she has an awesome name... maybe she will grow on me). We keep her in a crate at night, and Clark will curl up at my legs and finally rest after fending her off all day and purr. I feel sorry for leaving him at home with her all day by themselves. Since Thanksgiving, we have already been to one Christmas party, and have 2 more planned for this weekend, one a week from today, one the following weekend, and then it's Christmas! Only 11 more days of school - and 3 of those are exam days!! I love Christmas. I started wrapping presents last night and the living room looks so festive.